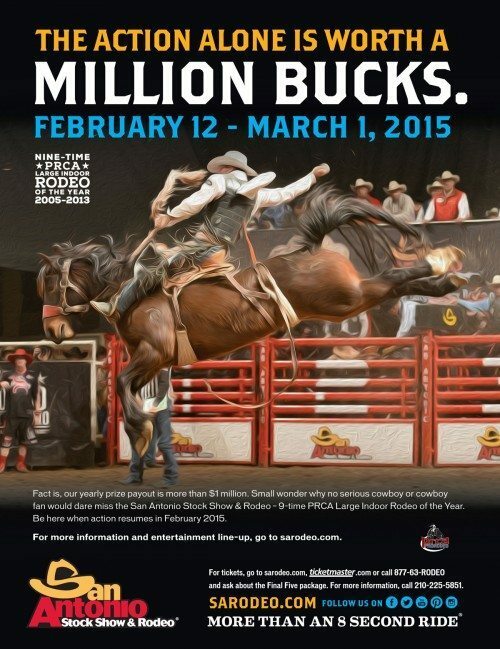 The San Antonio Stock Show & Rodeo is an annual event that takes place for 18 days in February. The organization provides financial support to Texas youth via patrons, donors, corporate partners and volunteers. It has become an event that long-term San Antonio and surrounding area residents are aware of, and most attend. However, it is an ongoing challenge to expand the audience and increase attendance, while reinforcing the brand and making the general public aware of their non-profit component and youth education-oriented cause. Given the popularity and knowledge of the event among local residents, the organization extended marketing initiatives regionally, to cost effectively expand their target market and grow their audience. The organization continued to have a presence locally leveraging the popularity of the event in the San Antonio community. However, more focus was placed on attracting a younger audience in order to increase attendance. Efforts were also made locally to educate the public on the San Antonio Stock Show & Rodeo’s commitment to youth education. These efforts were made to help develop a sense of pride within the San Antonio community and encourage individuals to show their support through increased attendance. Historically, marketing initiatives have been confined to a 90 mile radius around San Antonio. Through zip code analyses and fan/market/in-event surveys, the organization was able to pinpoint, what regional areas to focus marketing efforts on with limited dollars. Radio and mall signage were used to reach College Station, Waco, Corpus Christi and the Rio Grande Valley. An ad was also placed in Texas Monthly in the month of January for deep, statewide coverage. Additionally, columns were wrapped within the San Antonio International Airport terminals to target local travelers, as well as visitors to the market. Based on market analyses of the prevalence and frequency of San Antonio-area social channel users, it was determined that Twitter and Facebook would be the social media channels used to increase interaction with a younger and further-reaching audience. Dollars were shifted from some forms of traditional media (local magazines, local papers, etc.) to accommodate an increase in the social media budget. Ads were placed on Facebook, and Twitter using not only age specific and interest specific retainers, but also incorporating those additional areas noted in zip code analyses as regions which purchased tickets in prior years or engaged socially with the Rodeo’s channels. YouTube advertising through Google Adwords was also used to gain additional views on the San Antonio Stock Show & Rodeo commercials, opening video, volunteer video (therefore, again reinforcing the educational and volunteer aspect of the organization), and artist-specific soundbites and videos made for that artist’s upcoming performance during the Rodeo. Free and/or trade advertising on active social channels (i.e. the artists performing at the Rodeo, local organizations who support our cause, sponsors when applicable and available) was utilized to further the reach of the San Antonio Stock Show & Rodeo’s Facebook Fan Page and Twitter page. To further marketing efforts targeted towards a younger demographic, audio and banner ads were placed on Pandora and Spotify. The presence of online banner ads on local sites tripled. Online marketing also included iPad takeovers, where a banner ad covers the entire viewable area for a limited amount of time. Through research, it was determined that awareness of the San Antonio Stock Show & Rodeo’s mission of financial contributions to educate the youth of Texas was low. In an effort to educate the public, thus potentially increasing support, PSA’s were developed for local radio and TV stations. All media releases and correspondence throughout the event included detailed mention of the organization’s mission and educational contribution to date. Outdoor and print were also utilized, and a banner hung in the arena throughout the duration of the event for all attendees to see. The AT&T center undergoes a massive transformation to become the San Antonio Stock Show & Rodeo arena. This includes a complete rebranding, leveraging the San Antonio Stock Show & Rodeo look, logo and “Let’s Rodeo San Antonio…it’s more than an 8 second ride”. In addition to strengthening the brand within the arena, all marketing materials maintain a consistent look, with the logo and tag line. Elements within the AT&T Center were also altered for the 2014 show to incorporate the organization’s contribution to education. Two :30 TV spots were developed showing everyday individuals in or around recognizable San Antonio landmarks, coming down with and extreme case of “Rodeo Fever”. The creative in these spots support the message that the San Antonio Stock Show & Rodeo is a part of the community, and everyone’s involved. Two :15 TV spots with the same message were later developed, to reach a greater portion of the San Antonio audience. Additional :30 and :15 second TV and radio spots were developed to promote musical performances, as well as ticket and value-added promotions. These spots not only ran in the San Antonio area, but also in Corpus and Waco markets to reach the organization’s regional target. PSA’s in various lengths were utilized on radio and TV. These PSA’s included footage of past scholarship winners with messaging explaining that “Let’s Rodeo San Antonio” means more than just family fun and entertainment. That “it’s more than just an :8 second ride” means helping the San Antonio Livestock Exposition (dba San Antonio Stock Show & Rodeo) to commit more than 134 million to Texas youth since inception. An outdoor board and print ad were also utilized to educate San Antonio and reinforce this message. Numerous web banners were developed with a “Get Your Tickets Now” message, rotating from January through the duration of the show. Pandora and Spotify ads strategically ran on country and Christian channels promoting musical entertainment in those genres, and reaching a younger audience. To build and reinforce the Rodeo brand, the AT&T Center absolute take over included the main bar rebranding, extensive marketing in the halls of the AT&T Center, and logos’ placed throughout the center. The logo’s “S” hat was even placed on the cowboy and cowgirl figures located on the men’s and women’s restroom doors. All visual messaging was delivered with this year’s overall look, thus reinforcing the San Antonio Stock Show & Rodeo brand. Additionally, a two minute introduction video played prior to the rodeo, reinforcing the brand and capturing the spirit of the rodeo. The 2014 San Antonio Stock Show and Rodeo broke every attendance record. The overall attendance was a record breaking 1,740,154. During the course of the event, 8 days broke all time attendance marks on the rodeo grounds and 17 of 21 rodeo performances were sold out. Wednesday 2/19 had the largest overall weekday attendance ever recorded, with 91,031 attendants. Social media outlets grew exponentially with FB increasing 53.4% over last year, and Twitter increasing 87.2% over last year. There were 566,000 new website visitors, a growth of 12.4% over last year, and 3.8 million page views, 24.93% over 2013. Since inception, an impressive total of over $145 million has been raised to educate the youth of Texas. Last year’s total was $134.6 million.